Whenever I buy postcards or other pictures of Paris, I gravitate to anything unfamiliar. So when I was leafing through some inexpensive engravings at an antiques fair on the Place St-Sulpice in June, I was immediately drawn to this one. Barrière de la Cunette? “Where was that?” I asked the young woman who was in charge of the stall. She consulted Wikipedia on her iPhone and said vaguely that it had been on the Left Bank, over to the west. Of course I bought the engraving, along with one of the Barrière de Passy. Both dated from 1831. Time for some research. I knew a bit about the “barrières” (customs houses) that had once encircled Paris, because four of them are still there. The Rotonde de la Villette is one, and others can be seen in the Parc Monceau, the Place Denfert-Rochereau, and the Place de la Nation. However, I hadn’t realized how many there were originally (more than 50) nor did I know much about their creation. But first, I wanted to pin down the location of the Barrière de la Cunette. I consulted my reproduction 1850 map of Paris, which shows the city as it was before the 1860 expansion that reconfigured the city and its arrondissements. There it was, on the river’s edge near the Champ de Mars, opposite the narrow island known as the Allée des Cygnes, slightly downstream of today’s Pont de Bir-Hakeim. As it happens, the corresponding barrière on the Right Bank was that of Passy (also known as the Barrière des Bonhommes or Barrière de la Conférence). This map from Gallica dates from 1800. And just what, exactly, is a “cunette”? It’s a military ditch usually associated with fortifications; when filled with water, it becomes a moat (une douve). There appears to have been a ditch or canal emptying into the Seine at this point. Next question: when was it built? The vaguely Classical look seems to hark back to the First Empire of Napoleon, when Classical architecture was all the rage. In fact, it was designed and built in the dying days of the ancien régime, in the 1780s, along with 54 other barrières and the wall that encircled Paris. This was not a defensive wall; it was all about customs and excise. It was built at the behest of a group called the Fermiers Généraux (General Farmers), which sounds very rural and agricultural, but it was nothing of the kind. These were tax farmers, well-to-do financiers who collected money for the king and had a fair bit of leeway in how they approached their task. In the 1780s the Fermiers realized how easy it was to evade paying the duties required on goods entering Paris. Anyone could saunter in unobserved and smuggling was common. So they did what a typical financial concern would do these days: they commissioned a study by one of their number, Antoine Lavoisier (yes, that Lavoisier, the famous scientist known as the “father of modern chemistry”). Lavoisier’s plan was adopted in 1784 and the wall went up. It is long gone now, but a portion remains on rue Bruant on the grounds of the Salpetrière Hospital. Here is an image from Google Street View. The architect Claude-Nicolas Ledoux was assigned the job of designing the buildings that would be positioned wherever the wall crossed a major road (or the river). It was quite a commission. The barrières on major routes included offices for the tax collectors, sentry boxes and observation posts for the guards, living quarters for the staff, customs sheds, warehouses for impounded goods, and stables. Those on minor roads were less extensive. 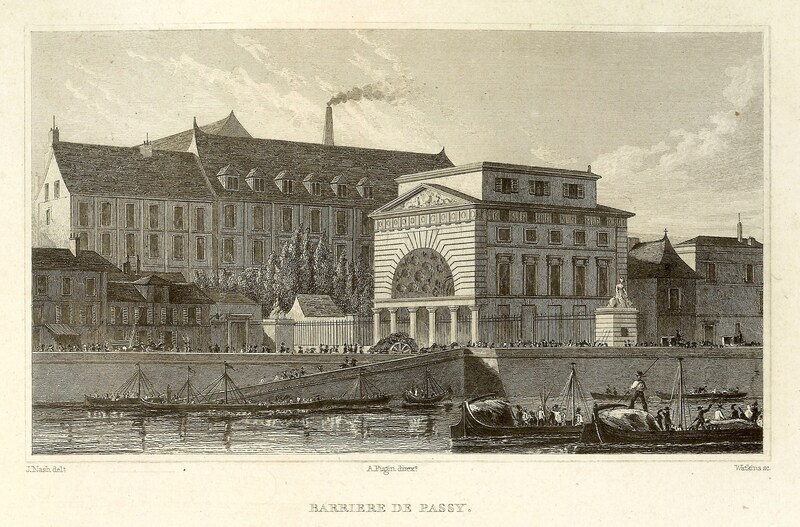 The Barrière de la Cunette and the Barrière de Passy, being on the river, had an additional feature: a boat called a patache that monitored river traffic and collected taxes on waterborne goods. 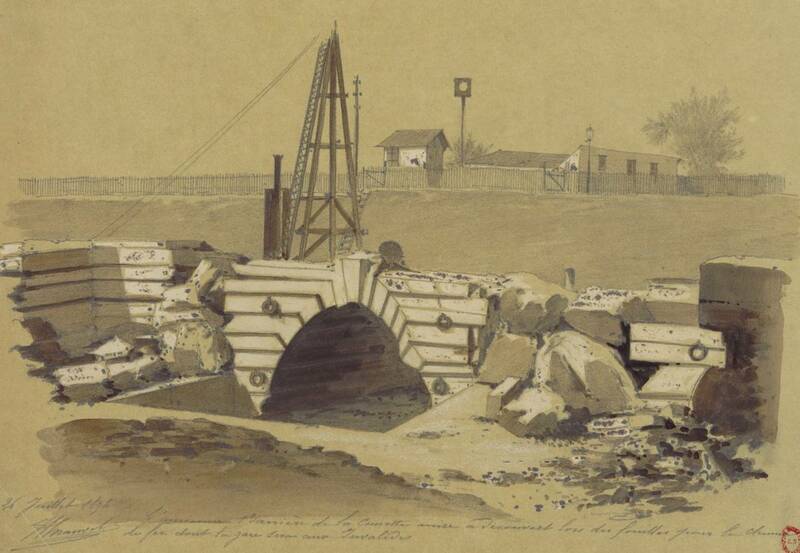 Here is a model of one of the pataches that Ledoux designed for the riverfront barriers, from the collection of the Musée Ledoux in Arc-et-Senans. I don’t know if this over-the-top vessel was ever actually constructed. There is no sign of it in the engravings. Ledoux called his barriers Propylées (or Propylaea, a Greek term for a monumental gateway), and ensured that no two were the same. The architectural historian Anthony Vidler notes that Ledoux had a “propensity for architectural overstatement and hyperbole, for elevating modest subjects by their architectural treatment.”* Indeed. 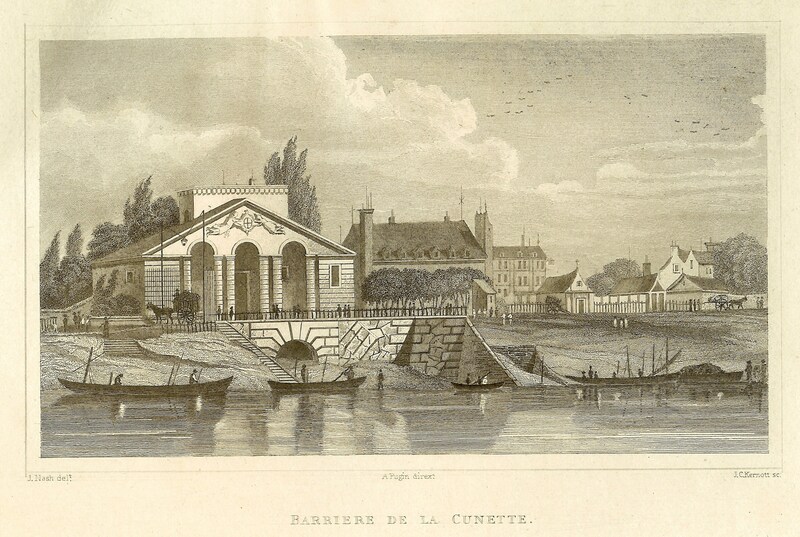 Compare the Barrière de la Cunette with the last customs post you passed in your travels. Vidler also describes how Ledoux went about the task of designing so many buildings: “all were invested with a similar architectural character, fabricated as it were out of a versatile kit of parts, abstracted by Ledoux out of Renaissance and antique prototypes, with apparently infinite properties for combination and re-combination.”** In other words, a classical Lego kit, but made up of columns, porticos, and domes. Ledoux enjoyed the work, but his employers (not surprisingly) complained of cost overruns and removed him from the project. Meanwhile, his fellow architects accused him of bad taste. And Parisians hated anything and everything to do with the wall. 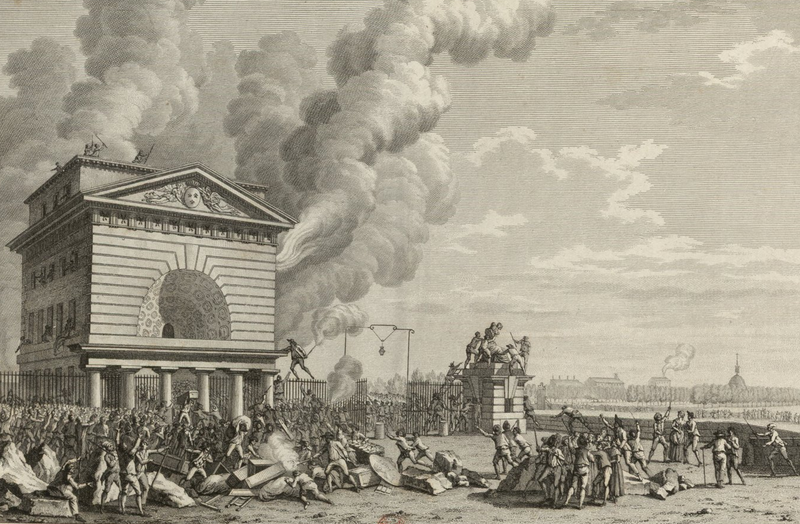 They did not attack Ledoux personally (he survived the Revolution), but a Parisian mob looted and burned the barrières, even before attacking the Bastille. The destruction started on July 10, 1789, and continued for several days. Forty-six barrières were badly damaged. One academic has argued that this attack was every bit as momentous as that on the Bastille on July 14, but has not received the same attention from historians. Here is a picture of the attack on the Barrière de Passy. These events did not, however, put the Ferme out of business, at least not immediately. The Fermiers appointed another architect to supervise repairs and the customs gates were back in business in 1790. As the Revolution proceeded, however, the Ferme lost power. The tax was suspended in May 1791, an occasion for boisterous celebrations by the populace. But nothing is as certain as death and taxes. The Terror may have killed the Fermiers, but the country still needed money, and in 1798, the tax on goods entering the city (known as octroi) was reinstated by the Directory. Octroi was collected in Paris until 1943. By the time the architectural draughtsman Augustus Charles Pugin (father of the celebrated architect Augustus Welby Northmore Pugin) decided to include these two barrières in his 1831 collection of 200 engravings called Paris and its Environs, the buildings were considered picturesque. Mind you, the English version of the book notes drily that the barrières were “by no means favorably regarded by the people” of Paris. The wall and most of the barrières were demolished in the 1850s and 1860s, as part of the expansion of Paris under Napoleon III and Haussmann. They no longer represented the outskirts of town and had no further purpose. The Barrière de la Cunette seems to have been forgotten until 1896, when the archway that once stood under the now-demolished customs building was rediscovered during excavations for a railway running along the Left Bank eastwards to the Invalides station. In this drawing by Jules-Adolphe Chauvet, the background looks bleak, compared to that in Pugin’s 1831 version. Ledoux probably thought his monumental Propylées would endure forever. He could not have imagined that 100 years later, the relics would be considered archaeological curiosities. Text by Philippa Campsie, map and additional images from Gallica. *Anthony Vidler, Claude-Nicolas Ledoux: Architecture and Utopia in the Era of the French Revolution, Basel: Birkhäuser, 2006, p. 106. This entry was posted in Paris architecture, Paris history, Paris maps and tagged Allée des Cygnes, Anthony Vidler, Antoine Lavoisier, Arc-et-Senans, Augustus Charles Pugin, Barrière de la Conférence, Barrière de la Cunette, Barrière de Passy, Barrière des Bonhommes, Claude-Nicolas Ledoux, Fermiers Généraux, Georges-Eugène Haussmann, Jules-Adolphe Chauvet, Musée Ledoux, Napoleon III, Octroi, Parc Monceau, Paris and its Environs, patache, Place de la Nation, Place Denfert-Rochereau, Propylées, Rotonde de la Villette, rue Bruant, Salpetrière Hospital. Bookmark the permalink. Love the detail about the tavern keepers. The moral must be:if you want to shorten your life, find a way to tax those heretofore untaxed! That was absolutely fascinating! The Levoisier connection especially. We have a rue de douves in the village where I live. I hadn’t realised that douve implied moat rather than just ditch. I’ll have to do some more ‘digging’ to find out if it ever was filled with water (I’ve not come across any reference so far, and it crosses one of the main old entrances to town, so there must have also been a drawbridge). Things change in these places much more than you realise. What village is that? It sounds quite ancient! Preuilly-sur-Claise in the southern tip of the Touraine. There has been a settlement here since prehistoric times and most of the village houses have medieval ‘bones’. It sounds idyllic! I looked at your blog and I love the photograph you recently posted. How wonderful to be living in such a historic spot! Thanks very much for finding a remaining section of the wall. You can see how ugly and high it was, shutting off the view of the surrounding countryside from Parisians. How they must have hated it. I’m surprised that it wasn’t knocked down completely during the early days of the Revolution and that it persisted as long as it did. 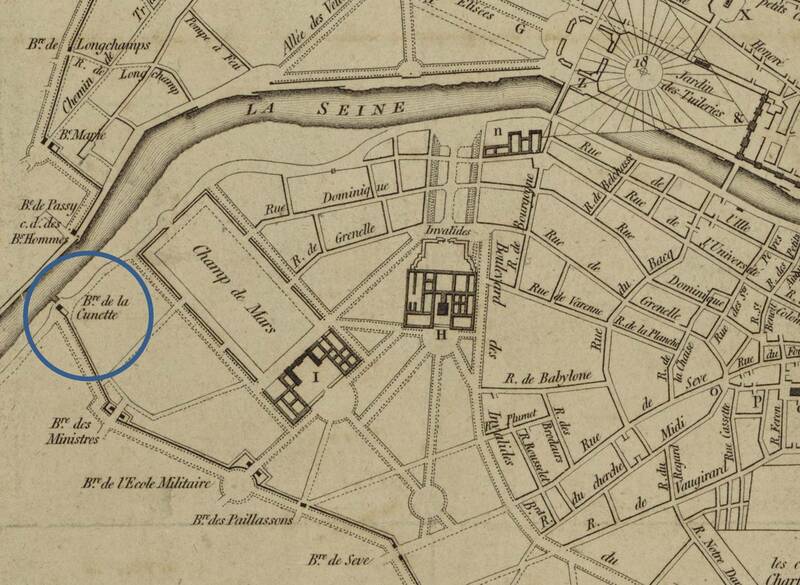 I live in the 14eme of Paris and was told that quite close to Rue Poinsot there had been both a wall and a toll gate. Thank you for your informative article as for several years I have been trying to locate information on both wall and toll gate. I was told that Rue Gaitie, 14eme located just outside the wall, had many bistros and cafes, avoiding the tax inside the wall! 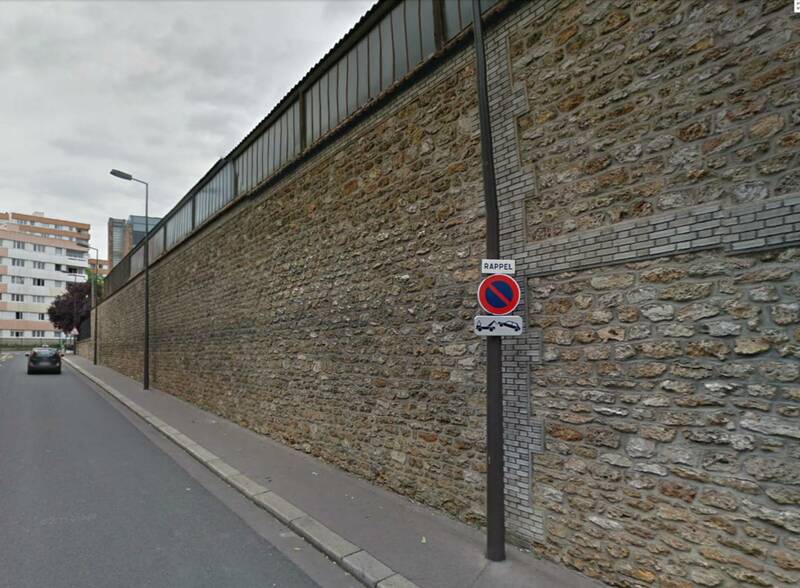 The wall ran along what is now the boulevard Edgar Quinet near the rue Poinsot (which was outside the wall and was called the rue Charlot). There were two tollgates nearby. One, called the Barrière du Maine, was located roughly where the train station is now, and to the east was the Barrière du Montparnasse, where the rue Montparnasse meets the boulevard Edgar Quinet (it become rue de la Gaité on the other side). You can find pictures of both Barrières using Google images. Thank you! I live on Rue Poinsot not aware of the name change from Rue Charlot. Years ago, I read that Rue Poinsot was one of the very oldest streets in Paris. That the name was that of a noted mathematician whose name is on a metal plaque on the base of the Eiffel Tower. There was no mention of the change from Rue Charlot.